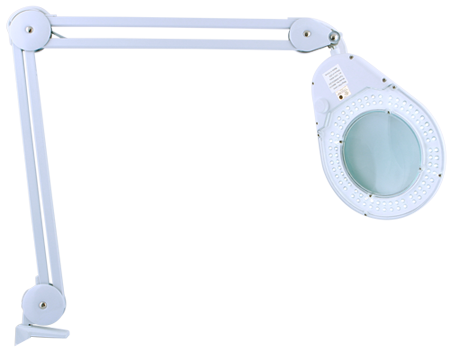 The LED Lighted Clamp-on Lamp Magnifier (MAG10) is a super-bright, LED lighted clamp lamp with a built-in magnification lens. With 90 Super Bright, energy-saving LED lights, the MAG10 doubles as an adjustable magnifying lens, and a bright desk lamp. The magnifying lens features a 1.75x magnification with a lens cover for protection. The lamp attaches easily to almost any desk, and helps to preserve precious desk space. © Zadro, Inc. All rights reserved.